If like me you own a Shih Tzu and are either thinking about or have decided to groom your Shih Tzu at home then you’ll be needing a good quality pair of clippers for the job. In this post, I’ll provide a list of the best clippers for grooming a Shih Tzu. I’ll explain the things you need to look out for when buying grooming clippers and give reasons why I think they are a good choice and provide links to where you can purchase them. 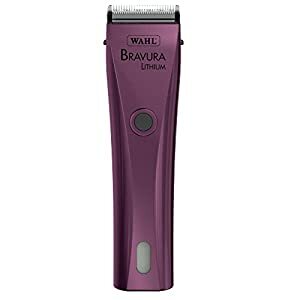 Our best choice award goes to the Wahl Professional Bravura Cordless Dog Clippers. They are cordless, light-weight and easy to handle, have a good battery and we think they are the perfect clippers for grooming a small dog like a Shih Tzu. You can read the extended review here. The main reason people decide to groom their dog at home is to save on the cost of visiting a professional groomer which can be quite expensive. However, for some people, it can be a big decision to make. When I first started to think about grooming my Shih Tzu at home my initial thought was that is wasn’t a good idea. I thought it was best left to the professionals. But after a little research on the topic, I realised this wasn’t the case. I did some research, purchased the necessary equipment and started to groom my Shih Tzu myself. The benefits from this decision include saving quite a bit of money and saving my dog from the stress of visiting a dog parlour, something he never enjoyed. If you have made the decision to groom your dog at home you’ll want to know the best clippers for a Shih Tzu. Below you’ll learn why a quality pair of clippers is important and a list of 5 clippers I think you might like. Whether to buy a corded or cordless pair of dog clippers for your Shih Tzu is probably the first thing you’ll consider. There are both pros and cons about either type and you’ll have to decide what option best suits your needs. The thing I like most about cordless clippers is that they are much easier to use and you can get to the more awkward parts of your dog’s body. Another benefit of cordless clippers is that once they are charged you don’t need a power socket near to the place where you are going to groom your dog. This is especially important if you are from the UK where there are no mains sockets in the bathroom. Also, if your dog gets very excitable or anxious during grooming, the lead from a corded pair of clippers may get in the way and make the experience that bit more awkward. However, there are a few less beneficial aspects to cordless clippers. Obviously, they need to be fully charged before you can begin to groom your dog. If you have not given your clippers a good charge before you begin you are running the risk of them stopping halfway through cutting your dog’s hair. Also, as with all batteries, with time the charge of the battery will slowly decrease and provide less time before they need to be charged again. This means that cordless clippers usually need to be replaced sooner than corded ones. Cordless clippers should give you about 45 minutes to an hour of cutting time, depending on the quality of the battery and the thickness of your dog’s coat. Another important factor is the speed of the cut. Cordless clippers tend to cut a bit slower and may not be suitable for larger dogs with a thicker coat. However, this isn’t too much of a concern for a Shih Tzu due to their type of coat, and if you keep on top of brushing your dog regularly then this shouldn’t be too much of a problem. One last concern is the length of the cut. With most cordless clippers you can’t change the blade and there are usually only a few different settings. This may be perfectly fine if you like the lengths they provide but it does limit your options on what lengths you can cut your dog’s hair. With a pair of corded clippers, you have the advantage of having a much wider choice of the length of the cut. Personally, I use a pair of cordless clippers on my Shih Tzu and have never had any problems. As with almost everything, you get what you pay for, and if you invest in a pair of good quality cordless clippers a lot of the problems listed above don’t matter too much. But I should point out I like to give my Shih Tzu a short and simple cut, especially in the summer, so having a variety of lengths is not too important to me. Better for reaching awkward places. Could stop part way through a groom. Duration of charge will decrease over time. Fewer choice of cut length. This feature of a pair of dog clippers refers to the speed at which the blades rotate. There are generally two types of speeds you need to be aware of when buying a pair of clippers for your Shih Tzu – single speed and variable speed. As the name implies single speed clippers rotate at a constant rate while variable speed clippers will have a few different speeds you can choose from. A variable speed pair of clippers may be a better choice for dogs with thicker coats and dogs with a matted or tangled coat. However, I feel this is less important for a Shih Tzu due to their more pliant coat, and if you regularly brush your dog then this shouldn’t be a concern. If you are just starting out with grooming your dog at home then a single speed pair of clippers are probably the best option for you. My single speed clippers have served me well and as I regularly brush my dog I’ve never needed a more powerful speed. Less effective on thicker coats. Less choice for more difficult cuts. This is quite an important thing to consider in my opinion. It may not matter to you too much how noisy your clippers are but imagine the difference it must make to your Shih Tzu? Remember that their hearing is 4 times more sensitive than ours. This is even more important if your dog gets anxious while being groomed. My little boy has a slightly nervous disposition so this was an important factor for me. However, if your dog is perfectly comfortable with loud noises then this may not matter so much. This will be something you have to judge for yourself as you know your dog best. My suggestion would be to err on the side of caution and get a pair of clippers with a less noisy motor if possible. Your dog will thank you for it, trust me. The benefits of a lighter pair of clippers should be fairly obvious. The lighter your clippers, the easier it is to move them around your dog, and the easier it will be to groom them. This is especially true if you have several dogs to groom as heavier clippers will cause your arm to ache after a while. Clipper blades come in different sizes, shapes and materials. Below I discuss these features and why they matter. You’ll find 2 types of teeth on dog clippers – fine tooth blades or skip tooth blades. The fine tooth blades are best used for dogs with a fine coat so is perfect for a Shih Tzu. This type of blade provides a smooth even looking finish. It’s important to note here that these blades will only work on a fine coat that has been well groomed and brushed through to remove any knots or tangles. If your dog has matted clumps of hair you’ll be better using a skip tooth blade. You’ll know if your blade is a fine tooth blade as there will be an “F” before the number (representing the length of the cut) on the blade. A skip tooth blade has more space between the teeth. This allows for more hair to pass through and are ideal for thicker or dirty coats and will leave your Shih Tzu with a more layered look. You’ll know your blade is a skip tooth blade as there will only be a number on the blade. As you can see from the images you can also tell just by looking at the spaces between the teeth on the different blades. There are 3 types of blade edging for your clippers. These are UltraEdge blades, CeramicEdge blades and ShowEdge blades. UltraEdge blades are infused with carbon and best suited for bulk trimmings and matted or tangled hair. Due to the infusion of carbon, they tend to last a lot longer than the other blades. CeramicEdge blades are specially designed to stay cooler for longer and the teeth tend to stay sharper for longer. These blades are useful for people who own several dogs or professionals who will be trimming several dogs in a short space of time. ShowEdge blades are the most expensive blades and are designed for precision trimming, leaving no tracks behind. If you want to enter your Shih Tzu in Crufts, these are the blades to choose! If you are only going to groom your Shih Tzu every few weeks or even less often, then your choice of blade is not too much of a concern. If you are a professional groomer or have several dogs to groom on a regular basis then the type of blade is something you should definitely take into consideration. Dog clipper blades come in a variety of lengths and are distinguished by their number. The number will be written with a hash in front of the number and will look like this – #5, #6, #7 etc. The number determines the length of the cut and the lower the number the longer the cut and the higher the number the shorter the cut. For example, a #5 blade will leave about 1/4” or 6mm and a #10 blade will leave about 1/16” or 2mm of hair. Below is a chart for the different lengths for the different blades. So what is the best blade for a Shih Tzu? This will completely depend on what kind of cut and style you want to give your dog. I hope I’ve given enough information above for you to have a good idea of what number blade you would need for the style you prefer. I like to use something around #5 as I like my Shih Tzu to have short hair. I think this is especially important during the summer months due to their susceptibility to overheating. And he just seems to prefer having a closer cut. Before I give you my list of dog clippers that I think are suitable for Shih Tzu grooming, I just want to give an example of the kind of thought process you should go through before making a commitment. Do I have a power source or extension lead to where I will be grooming my dog? Will my Shih Tzu get anxious with the noise of a loud motor? What kind of style do I want my dog to have (short or long or a mixture of both)? Do I brush my Shih Tzu regularly (do they often have matted or knotted hair)? Am I ok with refitting replacement blades? If it helps you can write down the answers or create a checklist that you can use when reviewing clippers yourself. I’ve included a range of clippers with different features so you should be able to find a pair that fulfils your needs. This is a good choice for a cordless clipper. It’s lightweight and you’ll have no problem moving around your dog and reaching those awkward spots. Wahl is a renowned manufacturer of hair clippers so you’ll know you are buying a quality product. It has a good lithium-ion battery which should give you around 90 minutes of cutting time which is pretty good for a cordless clipper. Another reason I like this product is that it isn’t too noisy. It has very low vibrations that is great for your Shih Tzu. 5 in 1 fine blade set with 5 adjustable sizes (#9, #10, #15, #30, #40). 6 attachment combs (#1, #2, #3, #4, #6, #8). Whenever I recommend a product I always check out the Amazon reviews and I advise you to do the same. This product has a 4.2 out of 5-star rating. You can check out the reviews for yourself here. Andis is another renowned manufacturer of dog clippers and they are very popular amongst pet owners. This set of clippers has 2 speeds (fast and slow) and a detachable blade. The detachable blade allows you the versatility to change the blade to any size and type you like and also allows you to give the blade a thorough clean. This model is compatible with all UltraEdge, CeramicEdge and ShowEdge blades that can be bought separately. The blade you will get out the box is a skip tooth #10 blade but can be changed to a fine tooth blade if that is what you prefer and can be bought separately. These clippers are a well designed sturdy piece of gear and will last you a long time. Suitable for all coat types, condition, and lengths. Detachable blade for easy cleaning. Compatible with all blade types and sizes. Fast and slow motor speed. Locking switch (stopping the blade from accidentally stopping). The Andis ProClip AGC2 has a 4-star rating from over 300 reviews on Amazon. You can check out the reviews for yourself here. As with Wahl and Andis, Oster has been a leading brand for dog clippers for many years so you know you are getting the quality you pay for. Like the Andis ProClip, the Oster A5 Turbo is a quality heavy duty clipper. It comes with an #10 blade that can be changed to a variety of other blade types and lengths from the Oster range. It has a two-speed setting allowing you to move from the slow speed for the delicate areas of the face to the higher speed for the body. One of the outstanding features of the Oster clippers is the engineering that goes into their blades. They are cryogenically treated to produce a harder blade improving its durability and life-span. Wider blade for faster clipping. This product has a 4-star rating from almost 2000 reviews, which should speak for itself. You can check out the reviews for yourself here. I’ve included this clipper set as a good option for those on a budget. Obviously, the quality of certain features will be inferior to the more expensive products but it is still a good set of clippers for the price. The blade is made from high-grade steel and has an adjustable blade with 3 settings (#30, #15, #10). One of the things that appeal to me about this set is the accessories that are included. It comes with 7 colour coded guides combs, storage case, stainless steel scissors, styling apron, styling comb, blade guard, and a how-to DVD. Powerful speed (7,200 strokes per minute). Includes a 16 piece grooming kit. Adjustable blade with 3 settings. This product has a 4-star rating from almost 3000 reviews. You can check out the reviews for yourself here. If you would like a larger selection of clippers for your Shih Tzu then please check out the grooming section of my shop.